A discussion of small power amplifiers, technical considerations, and a brief look at the power amplifier topologies. 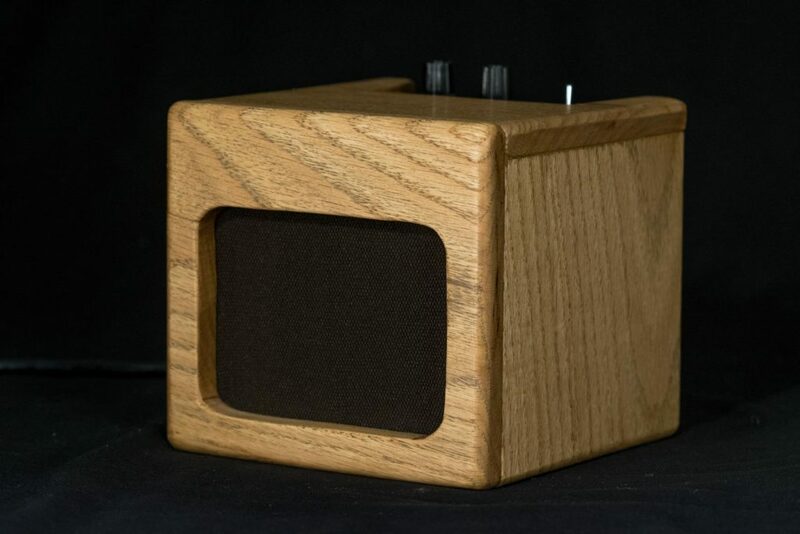 Goal: To build a small guitar amp with enough grit to rock out, but quiet enough to play in a dorm room . The LM386 is fun chip to play with, but fairly limited. Optimize your design to get the most out of it. Don’t use a 4Ω driver. 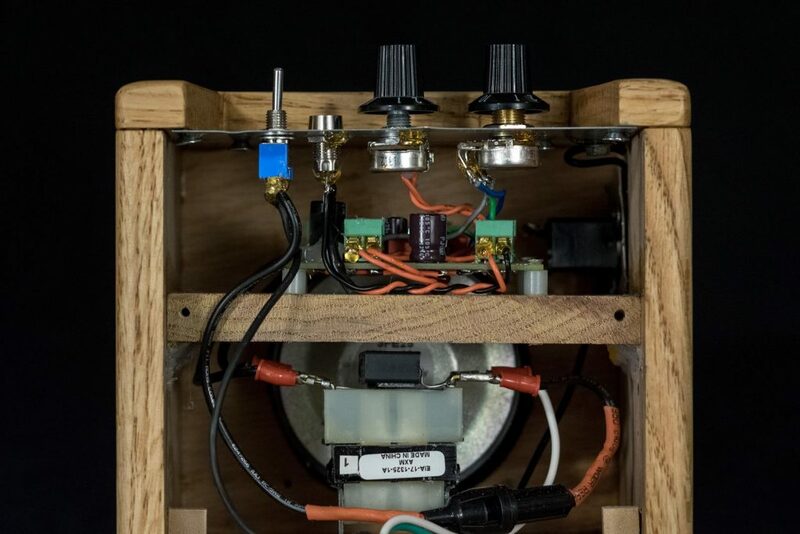 If you use a low impedance 4Ω driver and a 9V battery, you will barely get 0.3W out of it, with a whopping 3% THD (total harmonic distortion). That’s bad, real bad. A good amp is ~0.1% or less. To top it off, the LM386’s output stage is less than 30% efficient under these conditions. The maximum possible output power is achieved with a 16Ω speaker and 16V supply voltage. 0.6W @ 3% THD possible, with approximately 50% efficiency. Source: Texas Instruments. Click HERE to download. Actually, maybe don’t use the LM386 at all. The LM386 is ancient, dating all the way back to 1973. It has been a staple in the beginner/hobbyist community forever, but it is really a horrific chip if you care anything about audio quality. But, I do understand why it’s still so popular! If you are just learning how to solder, through-hole parts are typically easier to work with (compared to surface mount), especially if you don’t have a fancy soldering iron. If you search Mouser or Digikey for 1-10W amplifier ICs in a through-hole package, you’ll notice they basically don’t exist, except for, you guessed it, the LM386 (Texas Instruments) and one other, the TDA7266 (ST Microelectronics). So, there aren’t many options! The TDA7266 is a superior device in terms of maximum output power capability, and perhaps more importantly, distortion. It comes in a 15-pin package, but you only need to hook up about half of the pins to make it work. 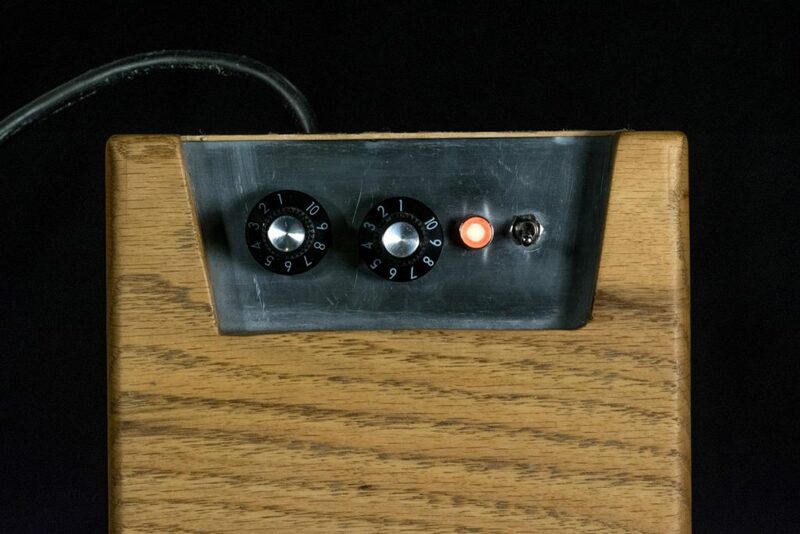 Try your hand at building an “upgraded” LM386 by using an op-amp and a Class-AB output stage. Check out this great blog post on building high quality, low power amplifiers from ludens.cl. The output stage of a power amplifier refers to the large transistor(s) used to drive current through a speaker, creating sound. The “Class” refers to how these transistors are configured. Class-AB is really just a Class-B amplifier modified to approach the excellent performance of a Class-A amplifier. Hence the name, Class-AB. At its heart, the LM386 is really nothing more than an op-amp followed by a Class-AB amplifier stage. It’s just old and not that great. Below is the functional schematic of the LM386. Or, use one of those new-fangled Class-D amplifier chips. Before the late 1990s, most power amplifier ICs used a Class-AB output stage. Class-AB provided the best trade-off between efficiency and distortion. But it’s still not that efficient, with a theoretical maximum efficiency of 78.5% (and it’s never that high in practice). Class-A, B, and AB amplifiers amplify input signals directly. An exact replica of the input signal is created, but with greater amplitude. The shape of the input signal is “copied” by either turning the transistors “more on” or “more off”. Class-D, on the other hand, approaches this from a different angle. 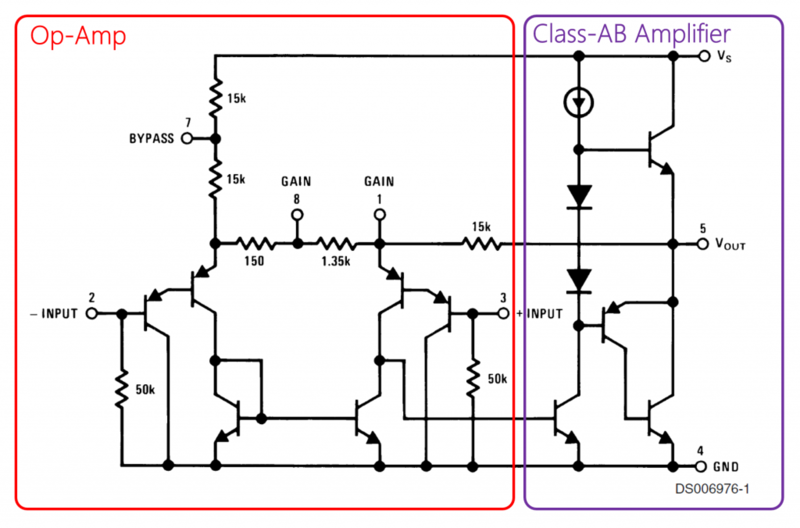 This is an excellent blog post written by Analog Devices, describing the basics of Class-D amplifiers. 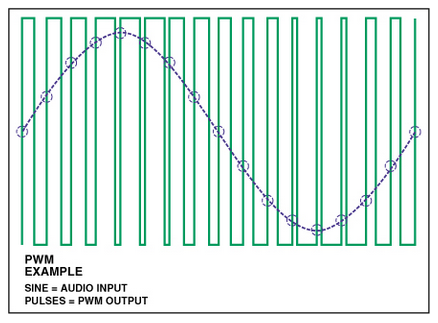 To start, the input signal is fed into a pulse-width modulator (PWM). This converts an analog audio signal into a pulse-width representation. That is, the higher the amplitude, the greater the pulse-width/duty cycle. Note: This is not digital, as in, there is no quantization of of amplitude and no storage in memory. The reason Class A, B, and AB amplifiers can be quite inefficient because the output transistors must dissipate some power to create the output signal. Dissipating power implies a voltage across the transistor, and current through it. Therefore, if we can eliminate, or reduce one of those numbers, we can reduce the device dissipation and increase the amplifier’s efficiency. When a transistor is operated as a switch, there is ideally zero voltage across it, and thus no dissipation. That’s the idea behind the Class-D amplifier. Instead of operating the output transistors as amplifiers (with lots of loss), we operate them as switches (with very little loss). If we apply the PWM signal to a transistor switch, we will get an amplified PWM signal of much greater amplitude. But, it’s still a PWM signal. So, to convert the square-wave PWM signal back into an audio signal, we pass it through a low-pass filter. This filter essentially “reconstructs” the audio signal by producing an analog level which is proportional to the duty-cycle of the PWM signal. Today, monolithic Class-D amplifier chips can produce staggering amounts in tiny packages, with efficiencies well over 90%.